Find out how to keep fruits and vegetables fresh. *Culinary Physics Blog consulted the U.S. Department of Agriculture (USDA), food scientists/technologist, professional chefs, agriculturists, food manufacturers, and other experts—to establish these storage guidelines. The first consideration was safety. But because you want your food to be delicious, too, for some products, Culinary Physics Blog chose the conservative storage time for optimum freshness. Eating more fruits and vegetables is a requirement for every healthy eater. But when you buy more fresh produce, do you end up throwing away more than you eat? You're not alone. Based on U.S. Environmental Protection Agency research (EPA), Americans throw away nearly 31.6 million tons of food every year. And a recent University of Arizona study found that the average family tosses 1.28 pounds of food a day, for a total of 470 pounds a year. That's like throwing away $700. Storing fresh produce is a little more complicated than you might think. If you want to prevent spoilage, certain foods shouldn't be stored together at all, while others that we commonly keep in the fridge should actually be left on the countertop. To keep your produce optimally fresh (and cut down on food waste), use this guide (download it for future reference- Storing Fruits and Vegetables). Cold storage of fruits and vegetables was used extensively by our ancestors to keep food after the harvest season. In modern times, the year round availability of fresh produce in the supermarket has reduced the use of home storage. However, even today there are benefits of home storage, which make it a good alternative to buying produce from the store. Most importantly, home gardeners often have excess fruits and vegetables that cannot be consumed immediately but would store well. Even those without gardens can buy food ‘in season’ when it is fresh and inexpensive and then store it at home until a later date. Both these options are cheaper than buying food in the winter when it is often quite expensive. In addition, stored food harvested at peak maturity from the garden usually has better flavor and a higher nutritional value. Use of Packing Materials - Packing materials used in storage perform several functions- insulation against fluctuating temperatures, moisture retention, and reduction of disease transmission. In outdoor storages, clean straw, dry leaves, corn stalks, hay, or sawdust are commonly used for insulation. These materials may be readily available or can be purchased relatively cheaply from local farms and garden centers. A slightly more expensive alternative is peat moss. Use these materials for a single storage season only, as they can become contaminated with molds and bacteria. They often can be recycled as mulch in the garden. Moisture retention of produce is usually achieved with moistened sand, sawdust or peat moss. Plastic bags, lined boxes, crocks, metal cans with liners, or plastic garbage cans are all items that retain moisture. Perforate plastic bags or liners at regular intervals to allow air circulation and prevent condensation and you can buy this easily at Amazon.com. Vegetables requiring moist storage should never be left directly exposed to air. Alternating layers of produce with packing materials reduces disease transmission. Wrapping individual items of produce with newspaper aids moisture retention and reduces the possibility of cross-transfer of odors and disease. Use of Refrigerator Storage - One of the best ways to store small quantities of vegetables requiring cold or cool moist conditions is to use an old or extra refrigerator. The amount of current required to run a storage refrigerator is usually low because they are opened infrequently and can be located in an out of the way, cool location. For best storage, produce should be washed free of soil and placed into plastic bags with 2 to 4 ¼” holes for ventilation. The 5 or 10 pound bag size is usually most convenient for the average family. Vegetables in plastic bags do not wilt nearly so rapidly as those stored openly in the refrigerator. Fruits and vegetables add color, flavor, vitamins, minerals, and fiber to your diet, and the quality of the produce you buy directly impacts the quality of the dishes you cook with that produce. Who wants to eat a wilted salad or a dingy bowl of fruit? Always seek out the best sources for produce. If you have a local farmers’ market featuring seasonal produce, browse the stalls and choose what looks best. You can plan a whole meal — or at least a memorable side dish — around a really ripe carton of tomatoes and a dewy bin of fresh lettuce, or what about those blushing peaches bursting with juice for dessert? When choosing and storing fruits and vegetables, whether from a farm stand or the supermarket, a few rules apply across the board. Avoid fresh produce with brown spots or wrinkled skin or produce that doesn’t look… well… fresh! 1) Grapes: Fresh, ripe grapes are full and juicy looking with a powdery bloom on the skin. Keep in the refrigerator for up to a week. 2) Bananas: Eat them before they turn completely brown. You can refrigerate them to slow down their ripening. Their peel continues to darken in the refrigerator, but not their flesh. 3) Apples: Should be crisp and firm. Refrigerate or store in a cool, dark place. Keep for several weeks. Some varieties keep for several months. Apples release a gas that makes other fruits ripen more quickly, so if you don’t want your fruit to ripen too fast, keep it away from the apple bowl and don’t store it with apples in the refrigerator. 4) Pineapple: It doesn’t ripen after it’s picked and is best if eaten within a few days of purchase. Keep at room temperature, away from heat and sun, or refrigerate whole or cut up. 5) Avocados: These tropical delights should yield just slightly to pressure when ripe. Keep at room temperature until fully ripened. If you won’t eat them right away, refrigerate them to keep for several more days. 6) Citrus fruits (such as lemons, grapefruits, and oranges): When refrigerated, citrus fruits (which don’t ripen further after they’re picked and are relatively long-storage fruits) keep for up to 3 weeks. 7) Cherries and berries: Keep refrigerated. For best flavor, consume them the same day you purchase them. Cherries and berries get soft and moldy quickly. 8) Tropical fruits: Mangoes, papaya, and kiwi should be firm but yield slightly to pressure and should smell fruity. Store at room temperature for more flavors, but refrigerate when they are ripe and then return to room temperature before eating. 9) Unripe melons and tree fruits (such as pears, peaches, and nectarines): Keep at room temperature so that they can ripen and grow sweeter. After they’re fully ripe, you can store them in the refrigerator for several more days. Melons are ripe when they smell melon-y at the stem end. And if we haven’t mentioned a fruit or vegetable you want to try… try it anyway! There are many interesting produce options out there in the world. The more you taste, the more you know. 10) Artichokes and asparagus: Refrigerate and use within 2 to 3 days of purchase. 11) Cabbage: Keeps for 1 to 2 weeks in the refrigerator. 12) Carrots: Best when firm, not rubbery, without a lot of little roots growing all over them. They keep in the refrigerator for several weeks. 13) Broccoli and cauliflower: Refrigerate and consume within a week. 14) Celery: Fresh celery is crisp and firm. Old celery flops around like a rubber pencil. Keeps for 1 to 2 weeks in the refrigerator. 15) Bell peppers: Store in the refrigerator for up to 2 weeks. 16) Corn: Refrigerate and use the same day of purchase. After corn is picked, its sugar immediately begins converting to starch, diminishing its sweetness. 17) Garlic: Garlic should feel firm, not soft, and should be without any green sprouts. Once it sprouts, it turns bitter. Keep garlic at room temperature, in a small bowl within reach of your food preparation area, to encourage you to use the fresh stuff. Garlic will last longer in the refrigerator, however, so if you don’t use it often, keep it chilled to inhibit sprouting. and butternut): Keep at room temperature for several weeks to a month. Store onions, potatoes, and winter squash in a cool, dry, dark drawer or bin. Onions, shallots, and potatoes should be firm. If they are soft or rubbery, they are past their prime. 19) Tomatoes: Store at room temperature for more flavors. Keep in a cool, dark place or in a paper bag to ripen fully. Once ripe, eat them right away. If you can’t, refrigerate them for two or three more days, although this can compromise the texture, making them mealier. Return them to room temperature before eating. 20) Cucumbers and eggplant: The skin should be firm, shiny, and smooth, without soft brown spots. Keep for up to 1 week in the cold crisper drawer of the refrigerator. 21) Leafy greens (beet tops, collards, kale, mustard greens, and so on): Very perishable. Refrigerate and consume within 1 to 2 days. 22) Spinach: Trim, rinse, and dry thoroughly before storing in the refrigerator for 2 to 3 days. 23) Green beans: Refrigerate and use within 3 to 4 days of purchase. 24) Salad greens: Rinse thoroughly, trim, and dry completely before storing wrapped in paper towel or in plastic bags in the refrigerator crisper drawer. They keep for 3 to 4 days. Do we have to tell you not to buy slimy lettuce? 25) Summer squash (zucchini and yellow squash): Store in the refrigerator for up to a week. 26) Mushrooms: Store in a paper bag in the refrigerator. Use within a week. 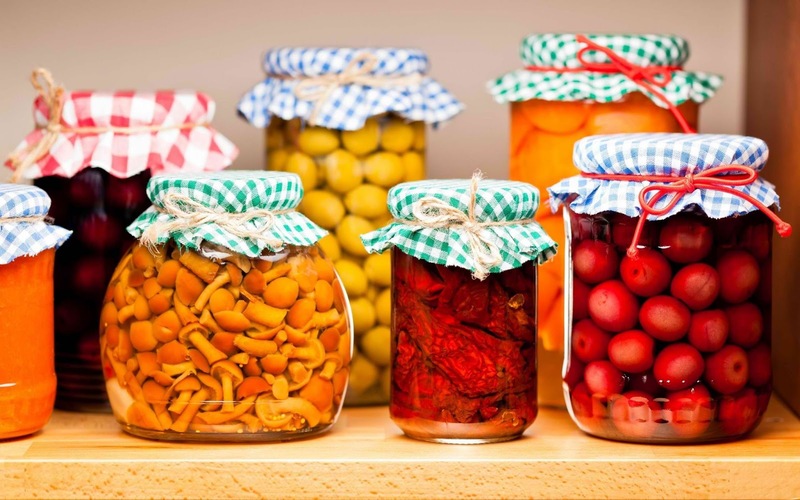 Remember when harvesting your own produce for storage, or buying it locally in season, there are certain guidelines to follow which assure maximum quality and minimum spoilage of your stored food. 1. Harvest fruits and vegetables at peak maturity or as near as possible. 2. Only use produce that is free from all visible evidence of disease. 3. Do not pick any fruit or vegetable that has severe insect damage. 4. Handle food carefully after harvest so that it is not cut or bruised. 5. Leave an inch or more of stem on most vegetables to reduce water loss and prevent infection. 6. Use late-maturing varieties better suited to storage. In general, use only the best food for storage. Damaged food is more likely to suffer mold and bacterial decay during storage and thus should be used fresh, processed, or discarded. The charts or tables below list temperature and humidity requirements for most vegetables. In addition to proper temperature and humidity, all fruits and vegetables must be kept in a dark, aerated environment. While most vegetables like moist conditions, standing water must be avoided, as it will quickly lead to rot. Produce must not be allowed to freeze and should be protected from animal pests such as mice. It is important to remember that crops held in storage are still living plants, capable of respiration and affected by their environment. The goal of storage is to keep them in a dormant state. One other note, fruits and vegetables should always be stored separately. Fruits release ethylene, which speeds the ripening process of vegetables. Fruits are also very susceptible to picking up the taste of nearby vegetables. Chart 1. Fruits and Vegetables that require cold, moist conditions. Chart 2. Vegetables that require cool, moist conditions. Chart 3. Vegetables that require cool dry conditions. Chart 4. Vegetables that require warm dry conditions. Do you want to know the right way to sauté onions to get the most of its flavor? Read…Maillard Reaction Mechanism and Its Applications to Your Cooking. If you don’t have time bookmark it and read it later.